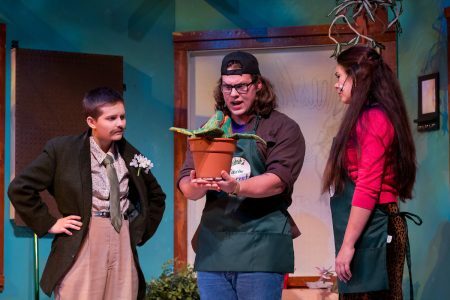 A man-eating plant will be on display in Randolph’s Thoresen Theatre this weekend as Randolph College presents its spring theatre production, Little Shop of Horrors. The sci-fi rock musical opens Thursday, April 19, at 7:30 p.m. Originally developed by Howard Ashman and Alan Menken as a screenplay, Little Shop of Horrors tells the story of a down and out flower shopkeeper named Seymour, who finds a plant that turns his life around. Seymour’s new fame and fortune means that Audrey, his coworker and love of his life, finally begins playing attention. But as the plant grows, so does its taste for murder. Director Patrick Earl said that aside from the monstrous plant and wacky, comedic scenarios, the play has an underlying message about the way people define themselves by their relationships with other people. Earl, who is an adjunct theatre professor, is excited to be directing his first play at Randolph. Little Shop of Horrors opens Thursday, April 19, at 7:30 p.m. in Thoresen Theatre, located inside the Harold G. Leggett Building. Shows are also scheduled April 20 and 21 at 7:30 p.m., and on April 21 and 22 at 2 p.m. Tickets are available at http://www.randolphcollege.edu/tickets/.